No, I am not biased. Yes, I loved this movie. I intend seeing it again for Chris Marquette’s portrayal of Buddy. I had to qualify with the first sentence because this is a true-blue Western based in Texas but adapted for modern times with American actors, accents and dialogues. The catch is, the producer, director and co-writer of the script is an Indian. The original kind from South Asia. That the lead character’s personality could be classified as autistic, but shown very subtly adds to the mystique. Some very tender interactions between Marquette and Maria Valverde have been handled with panache inside a hard hitting macho story, and those remain etched in one’s memory for their sheer beauty. And the fact that such a powerful story was shown in just over 100 minutes says a great deal about the direction and editing. Do I have anything negative about the experience? Yes, had the timing been just an hour earlier, I could have beaten the traffic on the way back. A small price to pay for an otherwise well spent afternoon. Again, not because of any bias, but based purely on my viewing pleasure I give it a [rating=6] rating. Don’t miss it if it comes to your attention. This entry was posted in Movies and tagged Autism, Indian, South Asian, Vidhu Vinod Chopra. Bookmark the permalink. 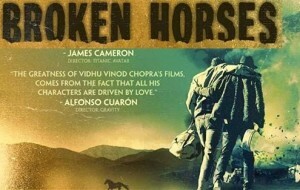 8 Responses to Broken Horses. i will watch for it rummy. not normally my kind of movie. but i always trust your reviews. as a matter of fact you review on a professional level i’d say. thanks! I am flattered. Thank you. As far as I can tell, it’s not available here — at least not yet. I’m glad you enjoyed it! Cheerful Monk recently posted..Good for Him! I suppose that it will eventually be available. It is too good not to. It was there hidden from your view! Alas, not available here. Unfortunately not available in India!